The third edition is here SOLD OUT! The third edition of The Phish Companion: A Guide to the Band & Their Music is more than an essential reference guide. It’s a hard-bound, 898-page, full-color feast for the senses. Completists will get lost in thousands of freshly-manicured setlists, song histories, and charts. Prose junkies will binge on hundreds of evocative show reviews and fan stories. Photophiles will gape at 128 pages of dazzling Phish photography – most of which has never been published. And poster collectors, get ready: The Phish Companion‘s eight chapters are anchored by stunning original works from Welker, Masthay, Helton, and more – each of whom was commissioned to freely interpret a period of Phish. No need to wait in line before “doors” for this art. If that’s not enough, the net proceeds of your purchase benefit music education programs via grants from The Mockingbird Foundation. Yes, the Phish story is one of epic sweep, but it’s also personal. It’s about the feeling that overtakes you when the lights go down and the roar comes up. Feel the feeling, right at your fingertips. 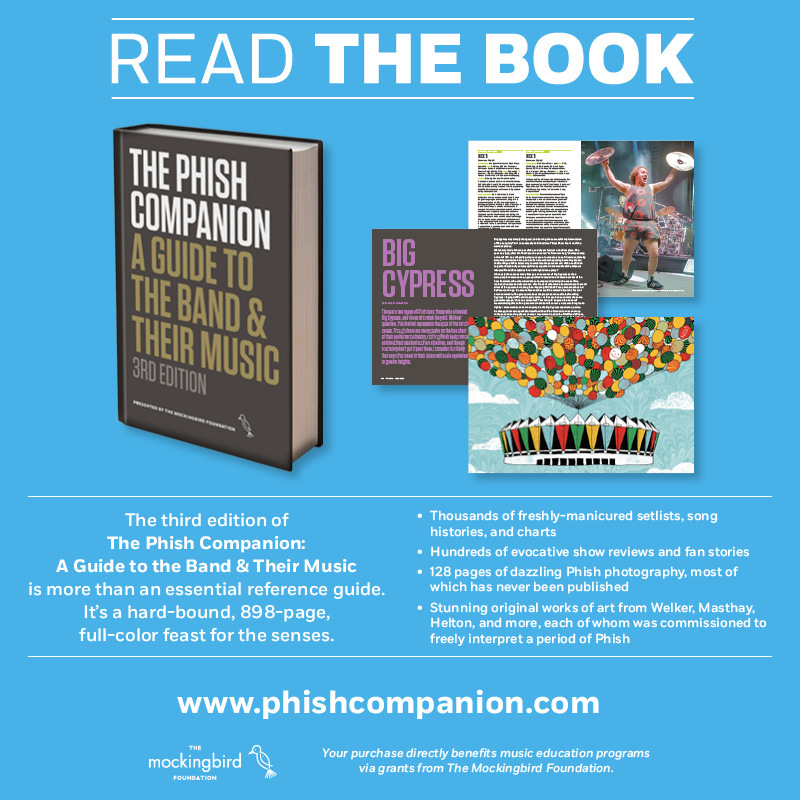 The Phish Companion is the category-leading, best-selling book about the band Phish, the most comprehensive, authoritative, and accurate reference available to Phish fans, produced on an entirely volunteer basis, with all of net proceeds supporting music education for children!